I was a very stubborn child. So stubborn I thought I could be a boy, if I wanted to. Or run to Hollywood and get the TV part I wanted. I wore my hair short, refused the handmade dresses my mother made for me, and threw all my dolls in the closet. I was the only girl who passed the flagpole test—climbing all the way to the swaying top of a flagpole—and so I was allowed into the all boy’s tree climbing club. I found kinship in a Swiss French girl, Dominique, who preferred skiing above anything else; we each blew on dandelions and decided that we could make the transformation happen. She went to private school, I public, and so every day I would race home, strip off my dreaded white knee socks and skirt and promptly shrug on pants before she arrived. 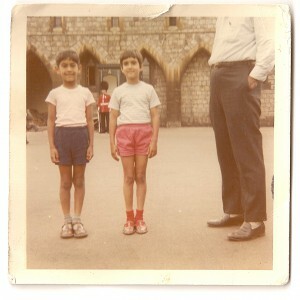 Summers my family went to England and my mother bought me identical clothes to my boy cousins—navy shorts, maroon pullover, crisp white shirt, punched leather shoes—a perfect English school boy. I believed I was half English and would come back from England, confusing my shillings with my dimes. My favorite show as “The Courtship of Eddie’s Father,” about a single dad, a boy, and his Asian housekeeper who lived in sunny California, where I was sure I would end up one day. I would memorize each show, and play act it at night, under the covers, when lights were out and I was supposed to be sleeping. Not surprisingly, I thought I could replace the boy actor Brandon Cruz and be Eddie. I wanted to run on the Santa Monica beach and have philosophical talks with my father. Eventually I wrote the head of CBS and asked about how to become an actress. Some assistant wrote back and told me to take acting classes. At the age of nine, I went away to sleep away camp and decided that instead of playing kickball I would write (and illustrate) a novel. During rest time, I hid away in my bunk or went over to the stream and wrote a novel about a boy whose parents were taken away to jail and then experiences a tornado and loses his ability to speak. The truth is, I ripped off the story from a movie I loved at the time, “Run Wild, Run Free,” which was set on the moody moors of England, and featured my favorite childhood favorite actor, Mark Lester, who also played Oliver in Oliver Twist. I didn’t think I could be Mark Lester, since he was so blond and fair, but I was keen to be the Artful Dodger in Oliver, played by the fantastically moxie Jack Wild, who lived just the next town over from my cousins in Middlesex, England. I wrote him too, but he never wrote back. That was okay. He was just a kid, after all. The climax of this stubbornness and fantasy came in sixth grade, when the graduation play was announced: Oliver Twist! Now I really burned to be the Artful Dodger. I could do a cockney accent—after all, I’d just spent a summer in England and had copied it from my little cousin, who had copied it from the handyman. And so I led all the sixth grade girls in a campaign to create more girls’ parts. Our harried teacher saw the justice of our cause (this was, after all, the heyday of 70s feminism) and so the girls could be part of Fagin’s gang, allowed to sit on the stage floor and pretend to look at our stolen goodies in our handkerchiefs. But that was just the first step in my secret assault. Every day I went home and practiced the part of the Artful Dodger in front of the mirror. I knew every song, every word by heart. At rehearsals, I sat next to the grimacing and dissatisfied teacher and watched the poor boy chosen for the Artful Dodger languishing on the stage—he did not seem to be having much fun, either. “I don’t need a script,” I told her calmly. Then I marched up on the stage, sang “Consider Yourself,” bowed, danced—and got the part. My friend Chris Carpenter loaned me his father’s silk opera top hat, which was the kind you punched open. I hid my ponytail inside and wore a vest and tails. I had a blast at the performance, dancing with tall Joanna Cox in her long red gown, and stunning my older brother who had, up to this point, pegged me as a quiet tag-along. Okay, I admit, it’s pretty pathetic to admit that one of the greatest highlights of your life is the sixth grade play. Stubbornness, an ability to see what’s inside your head as real and obtainable— gave me the first inklings of what it takes to be a story maker, a novelist. Now I’m a mother and I clash with my incredibly imaginative, incredibly stubborn children. Sometimes I wish I could get down on the rug and lose myself in aliens or imaginary baseball games. Only I have meals to cook, beds to make, mail to answer. And yet I do get lost, all the time, in the imaginary worlds of fiction on the page. And so I like to think: it’s not so bad being stubborn. Stay honest to your own imagination. Just don’t drive your parents too crazy.